Established in 2016, the Dementia Action Collaborative (DAC) is a group of public-private partners committed to preparing Washington state for the growth of the dementia population. The DAC hosts two meetings each year that are open to the public. This year’s meetings will be March 29, 2018 and September 26, 2018. 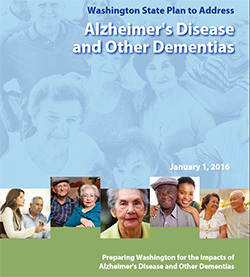 For a paper copy, please send your name and mailing address to dementiaroadmap@dshs.wa.gov.